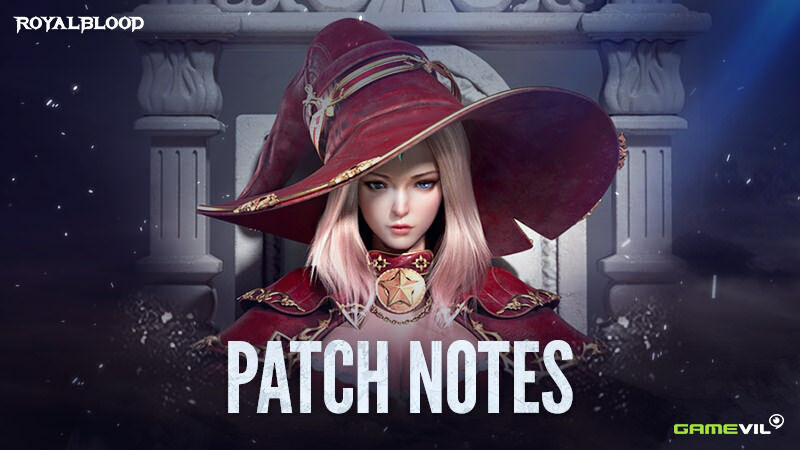 Here are the patch notes for the upcoming update! - Elixir Max Level will be raised to Lv. 30. - Arena's Training Rank Level will be raised. ㄴ Victor/Transcendent/War God Levels will be added. ㄴ For each Training Rank, there are 10 levels from Lv. 1 to Lv. 10. - A Guide to Character Boost will be added. ㄴ After creating a character with level boost, a tutorial about gameplay will be added. ㄴ The tutorial will explain how to use the Royal Box and guide through Special Growth's Bulk Growth. - HP Recovering Potions will be rewarded for completing a Character Boost Guide. ㄴ 1,200 HP Recovering Potions will be rewarded. - Larpy's Feather will be dropped at the Field/Battlefield. ㄴ You can gain EXP by making a wish at Larpy's Altar using the feather. - Fixed an error where a delay occurs when you raise the level of first section from each skill. - Fixed an error where a purchase pop-up shows up because event Item list's horizontal scroll function is recognized as a tap. - Tier Equipment Summon Ticket's Summon rate will be changed. ㄴ Find it at Shop>Summon Ticket>Tier Equipment. - If you purchase 10+1 Tier Equipment Summon Tickets, you can get a bonus. ㄴ Purchase 10+1 Tier Equipment Summon Tickets 3 times and get a [Tier 4] SS-Rank Equipment from [Claim]. - The price and rate for Pet Hatch Ticket will be changed. ㄴ From Shop>Summon Ticket>Pet, 10+1 Pet Hatch Ticket price will change to 1,000 Diamonds. ㄴ If you purchase 10+1 Pet Hatch Tickets, you are guaranteed to get one [B] Rank Pet from those 11 tickets. - If you purchase 10+1 Pet Hatch Tickets, you can get a bonus. ㄴ Purchase 10+1 Pet Hatch Ticket 3 Times, and you can get [A] Rank Pet from [Claim]. - You can now buy several Equipment Enhance Material Summon Tickets/Rare Material Summon Tickets at once. ㄴ Buy maximum of 100 Tickets at once. ㄴ Find them at Shop>Summon Ticket>Growth Material. ㄴ Larpy Marbles/Spirit's Plumage will be added. ㄴ Find them at Shop>Basic Goods>Supplies. - 3 new Material Type Follow Packages will be added. 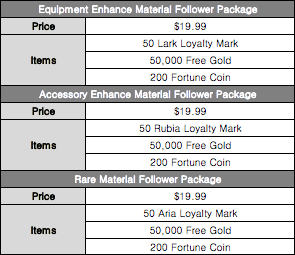 ㄴ Equipment Enhance Material(Lark)/Accessory Enhance Material(Rubia)/Rare Material(Aria) Follower Packages will be added. ㄴ Find them at Shop>Event>Special Sale. - Effects and prices of Shiny Hoe/Pickaxe from Guild Shop will be changed. - Increases the number of resold and purchased Lucky Pouch package. ㄴ The purchase limit for the double pocket package is added once. ㄴ If you have already purchased a double pocket package before, you can purchase it once more. ㄴ If you have not previously purchased a double pocket package, the purchase limit is two times. Last edited by CM_Arcain; 01-30-2019 at 12:12 PM.